Commencing business with a Fusion Splicer, Yamasaki has now developed a complete range of test and measurement products that include Fiber Optic Light Sources and Power Meters, Fiber Optic Talk Sets, PON Testing Products, Microscopes, Videoscopes and Visible Fault Identifiers. In Addition to the Yamasaki Test and Measurement product range. Yamasaki has developed a large range of Optical Networking Products with the introduction of high quality SFPs, XFPs, X2s, Xenpaks, SFP+, GBICs, Switches, CCTV Products and Media Converters. These products have proven to be viable alternatives to other major manufacturers offerings having great success competing against major competitors across the globe. what can Yamasaki do for you? SFP’s – SFP’s (Small Form-factor Pluggable) are small transceivers that plug into the SFP port of a network switch, to allow fiber connectivity between the fiber optic cable and other electronic devices. SFP’s come with multitudes of varying specifications to accommodate the largest amount of networks, with distance ranges up to 100Km, LC and SC connectors, Omni and bi-directional operation plus many more features. Learn more about Yamasaki’s range of SFP’s. Media Converters – Singlemode Media Converters are often used in pairs to convert a copper transmission to fiber optic transmission and back again, with some media converters being able to operate bi-directionally and use multimode functionality. 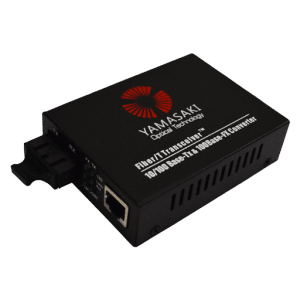 Yamasaki offers a large range of Media Converters to suit your needs. Learn more in our networking range! Increase Your Network Range – By incorporating both SFP’s and media converters to your network, you can increase your network range and speed dramatically. If you are interested in taking the steps to utilize the amazing speed and power of fiber don’t hesitate to contact us! OTDR – The Optical Time Domain Reflectometer (OTDR) is useful for testing the integrity of fiber optic cables. It can verify splice loss, measure length and find faults. The OTDR is also commonly used to create a “picture” of fiber optic cable when it is newly installed. Later, comparisons can be made between the original trace and a second trace taken if problems arise. Yamasaki offers a range of OTDR’s including single and multimode OTDR’s. Learn more about the Y24 OTDR . Fusion Splicing – Fusion splicing utilizes mechanical power to precisely align the cable ends, fusing the cables together using an electric arc, it is generally the most common method of splicing yielding the lowest loss and least reflectance while still providing the strongest most reliable join. 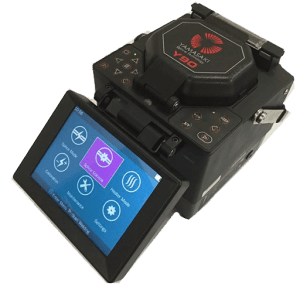 Learn more about the Yamasaki Y90 Fusion Splicer. Optical Fiber Inspection and Testing – Many of the problems relating to Fiber Optic Networks are caused by poor connectorisation. Since the light used in systems is invisible infrared light (IR) beyond the range of the human eye, one cannot see the system transmitter light. By injecting the light from a visible source, such as a LED, laser or incandescent bulb, one can visually trace the fiber from transmitter to receiver to ensure correct orientation and cable integrity. View the Test & Measurement range to learn more. June 16, 2017 How confident are you about your cable connector cleanliness?